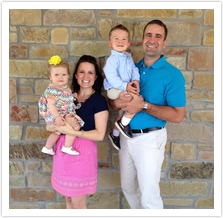 Dr. Jarrod Lack joined TLC Dental in June of 2010 after completing his training at the University of Oklahoma College of Dentistry. Since graduation, Dr. Lack has expanded his skillset to include Invisalign, dental implants, root canals, as well as children's dentistry. Dr. Lack is an Enid native and is a 2002 graduate of Chisholm High School. After high school he attended the Universtiy of Central Oklahoma where he received a Bachelor's degree in biology. He then attended the University of Oklahoma College of Dentistry where he graduated in 2010 in the top 10% of his class. Dr. Lack always wanted to return home to practice. "Enid has always been my home. I am very thankful for being given the opportunity to practice with Dr. Tefft. I am very grateful for the chance to return home and take care of my friends and family." Dr. Lack married Tiffany Swyden Lack on August 14th, 2009. On July 5th, 2011 they had their first child Hudson James. On June 6th, 2013 their daughter Olivia Adelle was born. They are active members of St. Francis Xavier Catholic Church. He enjoys lots of outdoor activities including fishing, hunting and golfing.